Wild horses at the Sulphur Herd Management Area in Utah before last winter’s Bureau of Land Management helicopter roundup there. RTF file photo by Steve Paige. An advocacy group is alarmed over the position adopted by the National Wild Horse and Burro Advisory Board, fearing it will ultimately lead to the deaths of thousands of wild horses. The board, comprising representatives from a range of stakeholders, meets regularly to make recommendations to the Bureau of Land Management (BLM) on the ongoing management of wild horses. Its role is advisory only and it does not have the power to control policy. Last week, at a meeting in Grand Junction, Colorado, board members carried a motion recommending that the BLM phase out long-term holding over the next three years and apply that budget to on-range management and adoptions. It further urged the BLM create funding mechanisms to maximize adoptions and or sales, especially through successful programs, and to include international adoptions and/or sales. It recommended that funding for reversible fertility control be increased in the 2019 fiscal year. It also urged the government agency to immediately (within the next three years) follow federal legislation and remove excess animals from the range to achieve the overall appropriate management on the western rangelands of just under 27,000 horses across all herd management areas. This could see the muster of tens of thousands of horses, based on current population estimates. Board members resolved that the BLM should mantain the reduced on-range population by using fertility control to slow population growth at levels where removals equal the adoption demand. A March 1 BLM estimate – made before this year’s foal crop — placed the on-range population of wild horses and burros at 72,674. As of August, the agency reported that 44,640 captured wild horses and burros were living in off-range facilities, including 32,146 on leased pastures referred to as long-term holding. The stance of the board has raised the ire of the advocacy group Return to Freedom, which voiced alarm at plans to phase out long-term holding and slash the on-range population – all within three years. “If Congress allowed BLM to follow through on the independent board’s recommendations, that would mean the government shooting at least 90,000 healthy animals,” it asserted in a statement. It also criticized the recommendation to allow international adoptions and sales, fearing it would amount to a death sentence for the selected horses. 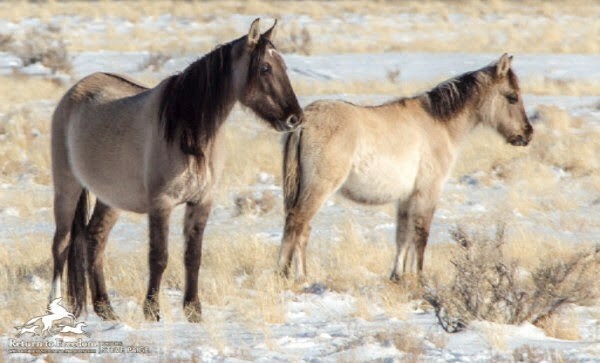 “Killing tens of thousands of wild horses and burros would be a betrayal of millions of taxpayers who want wild horses protected as intended in the 1971 Wild Free-Roaming Horses and Burros Act and who have invested tens of millions of dollars in their care,” said Neda DeMayo, who is president of Return to Freedom Wild Horse Conservation. The group said the BLM has been close to its appropriate management level before, but balked at using fertility control despite ample evidence that it was safe and effective. It said the number of wild horses on the range stood within 1071 animals of the BLM’s own population goal in 2007, yet, even then, the agency chose not to aggressively implement fertility control. The nonprofit group noted that the BLM had never spent even 4% of its Wild Horse and Burro Program budget on fertility control. In contrast, it spent upwards of 65% of its annual budget capturing, removing and warehousing animals. Wild horses continued to be dramatically outnumbered on federal land by privately owned livestock, which graze there at a fraction of the cost that ranchers would pay on private property, the group noted. “A balance must be struck between ranching and mining interests and wild horses and other wildlife as part of a fair interpretation of BLM’s multiple-use mandate on the range,” DeMayo said. “There needs to be a fairer distribution of resources – not more biased reports and recommendations aimed at capturing, removing or killing wild horses. “BLM and the US Department of the Interior must stop catering to those who profit from public lands and manage them for all Americans. It noted that at last week’s advisory board meeting, wild horse advocate Ginger Kathrens, of the Cloud Foundation, was the lone dissenting vote on recommendations that BLM achieve the appropriate management level of 26,715 in three years, close long-term holding in three years, and allow international sales and adoptions. She joined the others on the board in voting to recommend that BLM increase its funding of reversible fertility control. Kathrens noted that the BLM arbitrarily set the appropriate management level at only about 1000 wild horses and burros more than the estimated population at the time of the Wild Free-Roaming Horses and Burros Act was signed. The group said any increase in adoptions would likely spare only a fraction of wild horses on the range or in holding from death. In 2017, the agency adopted out only about 4200 wild horses – its best total in years. In September 2016, the advisory board voted to recommend destroying captive wild horses and remove all restrictions to their sale, which would allow buyers to purchase them on the cheap and transport them to Canada or Mexico for slaughter. Kathrens was again the lone “no” vote. 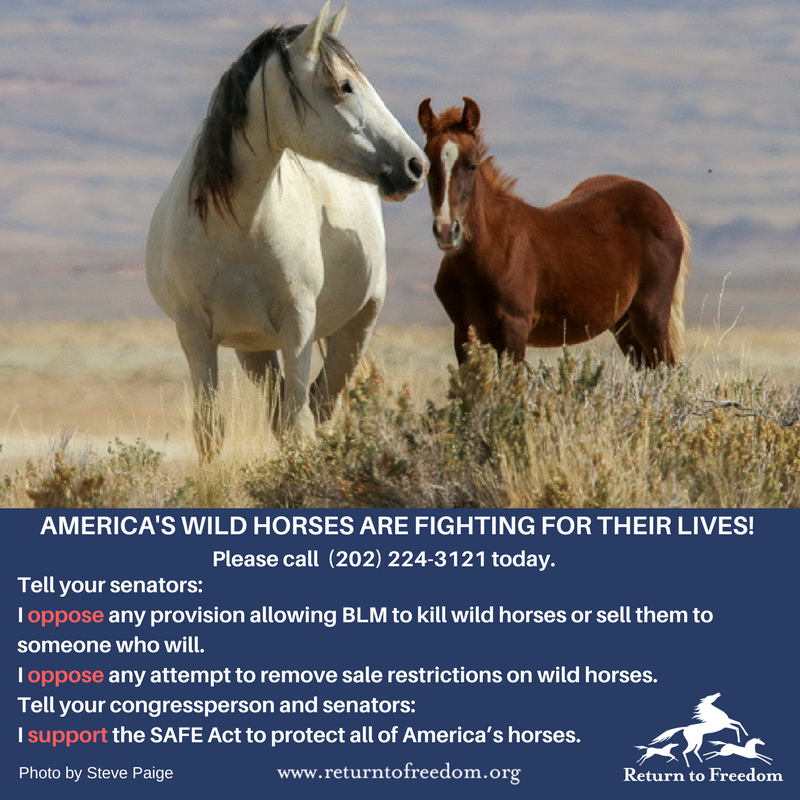 In July, the House Appropriations Committee approved an amendment to the Interior Appropriations bill that removed language that would bar the BLM from killing healthy wild horses. The Senate Appropriations Committee could vote on its version of the Interior bill as soon as next week. “It will take time, commitment and diligence – and a real plan – but we have science that clearly shows the path to a sustainable future for wild horses and burros,” DeMayo said. “It’s not going to happen overnight, but it must be done and it must start now.